During the first Spam Restaurant Month, which is happening throughout August, 30 restaurants throughout the country are putting some really, really interesting spins on Spam. Scotland made mayonnaise-flavored ice cream. Australia put broccoli in lattes. So it’s only natural that some in the U.S. with unusual mashup-food cravings would be feeling left out. Duck Inn ChicagoThe Duck Inn in Chicago created a Spam Mai-Tai cocktail to celebrate America’s most popular canned-meat product. Cheers! 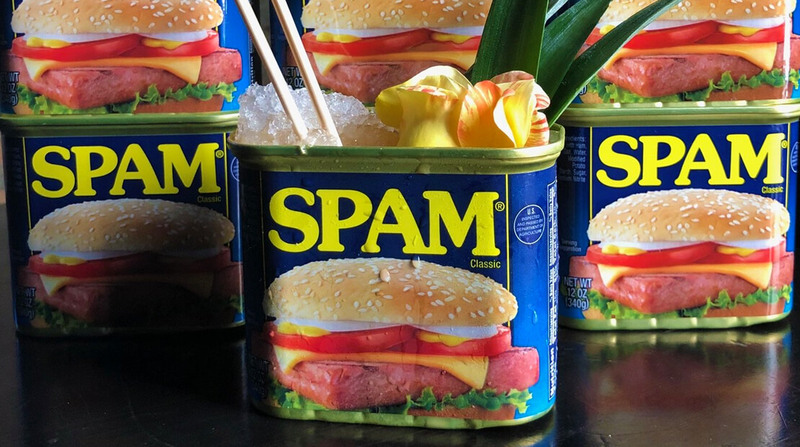 During the first Spam Restaurant Month, which is happening throughout August, 30 restaurants throughout the country are putting some really, really interesting spins on Spam. The freakiest and most intriguing concoction may very well be The Duck Inn’s Spam Mai Thai. Yes, folks, that a sweet and salty version of the famous tropical cocktail. Oh yeah, and it’s served in a can … a real Spam can. For those who are skeptical, don’t worry — there won’t be any chunks of meat floating around in your drink. Foodbeast, which has partnered with Spam for Spam Month, says the drink is infused (rather than mixed) with the porky product. Brandon Phillips, The Duck Inn’s beverage director who created the drink, started by mixing lard with Spam and two different types of rum, and let that mixture sit overnight. He then strained the lard-liquors and blended the infused liquid with fresh pineapple juice, lime juice, orgeat syrup and bitters.